Photovoltaics convert light into electricity. As on Earth the Sun is the only natural source of light, photovoltaics are used to make energy from it. Nowadays this is a very fast growing industry that has found its place in all countries throughout the world. Many people believe that this is the future of energy as it's source is practically free and inexhaustible. The two main photovoltaic systems are stand-alone and grid-connected. In stand alone systems the power is stored in batteries while in grid connected systems the produced electricity goes directly into the grid and is used by the public. The trends show that while in the developed world where the conditions for connecting to the grid are much better, grid-connected systems are dominating, in the developing countries still stand-alone photovoltaics are the best and only option for some households. Of course stand-alone systems have its niche even in industrialized countries as new low cost products appear on the market. Stand alone systems can be applied to: electric vehicles, houses in the mountains, street lamps, signs, water pump systems, charging devices etc. Stand-alone systems basically consist of photovoltaic modules, charge controller, batteries and inverter. If no AC electricity is required the inverter is not necessary. Grid-connected systems can be installed on roofs, land and can be integrated in all kinds of buildings. Grid-connected photovoltaic plants can provide electricity for millions of households. The rectangular form of the modules makes them very practical. Nowadays there are transparent and even flexible photovoltaic modules. Life on Earth depends on the light and heat that is received from the Sun. Scientists have proved that even a little part of the solar radiation is enough to satisfy the global demand for energy on Earth. The solar constant which is 1367 W/m² defines the average intensity of solar radiation that would be received by the Earth if it were not protected by the atmosphere. As a result of this protection solar irradiance is up to 1000 W/m² on clear days. The yearly values differ greatly depending on the latitude and other factors such as the weather. Depending on it's wavelengths solar radiation is ultraviolet, visible light and infrared. Infrared radiation is responsible for around 50 % of the heat that comes from the Sun. 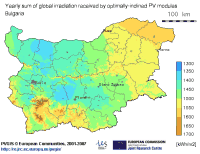 The heat is one of the enemies of photovoltaic modules because it decreases their efficiency. This is why not all modules are appropriate for regions with warm climates. It is proved that amorphous silicon modules are more temperature resistant compared to crystalline modules. On the other hand crystalline have higher efficiency which means that they are more favorable when the plot of land is limited or land is too expensive.